For eight years now, I’ve been posting about my annual writing income. There’s a lot of misinformation about what it’s like to be an author, and not as much actual data. You can’t draw any broad conclusions from one data point, but I figure one data point is still better than none, right? Previous Years: Here are the annual write-ups going back to 2007: 2007, 2008, 2009, 2010, 2011, 2012, 2013, 2014. 2015 Summary: I’m happy to say that 2015 was my best year yet, edging out 2013 by about $900 or so. Before taxes and expenses (but after my agent’s commission), writing brought in $61,756.93. I didn’t sign any new book deals last year, but I did have two new books come out — the hardcover edition of Unbound (mass market edition comes out tomorrow! ), and the tie-in novel Fable: Blood of Heroes. Other significant income included the Delivery & Acceptance payment on Revisionary, and royalties on Libriomancer, which was a $1.99 Kindle Daily Deal twice during the year. I only sold one short story last year, since I was putting the bulk of my time and energy into novel-length work. That trend will probably continue in 2016. One interesting note — interesting to me, at least — is that the self-publishing slice of the pie is more than double what it was last year. This is primarily thanks to Rise of the Spider Goddess, which I self-pubbed at the end of 2014. As always, a significant chunk of that money will go right back into taxes. There will also be at least a few thousand dollars in other expenses, from convention travel costs to postage to other business expenses like website hosting, bookmark printing, etc. But I won’t have final numbers on all that until I’ve done my 2015 taxes. There’s a very good chance that 2016 will be an even better year. I’m hoping to sign a new multi-book contract with my publisher. I also have my NaNoWriMo project that we should be able to shop around this year. And if I can make time, I want to delve more into the self-publishing side of things. 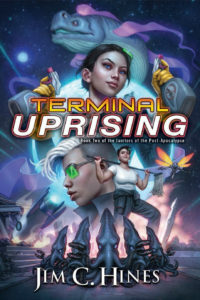 The short story I put out a few weeks ago confirmed that there’s a market for tie-in work to my various series, and I’d love to go back and write a bit more in those different worlds. Of course, 2016 will also be the first year where I don’t have the income of my full-time job, which is intimidating. But right now, I’m feeling pretty good about it all. I hope this is helpful. Please feel free to ask questions. And here’s to a wonderful and productive 2016 to us all! « Chupacabra’s Stats	» IT’S BOOK DAY!!! Thanks a lot, Jim, these posts are such good reads – I really appreciate you sharing something as personal as income. Better discussions around income and pay will help writers in the long run – would love to see others follow your example! Hi Jim, thanks for sharing. As a new/unknown author I read these posts with great interest. While you share your publishing incomes, you don’t break it down further into advances and royalties, and I’m assuming most of your books have earned out at this point. I’m curious if this just a personal thing, or if your publishers prefer you don’t share such info. Thanks for the numbers, Jim. As you wrote: there is too little data available and your data provides a valuable insight. 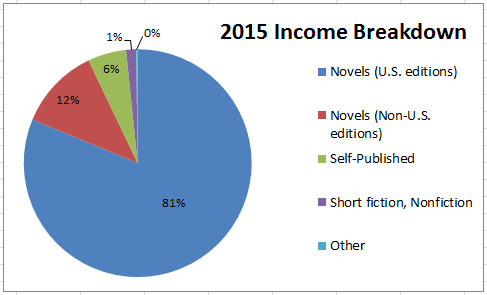 Remark (as in the previous years): the “Novels (U.S.)” income portion is probably misleading as a large parts of the international readerships gets sorted in there. When (and every single reader of yours I know personally in Germany does so) a reader buys the English language version on Amazon, he provides money under the “Novels (U.S.)” label. Unluckily it is impossible to get any hard numbers from Amazon :-(. Perhaps some Bard will help us someday…. Most of my colleagues and contacts who self publish are in romance genre. How is self-publishing for fantasy writers? A challenge to sell to that market? I’m not an expert in that area, but I know people like Annie Bellet and MCA Hogarth and Harry Connolly have had a lot of success self-publishing and selling their fantasy work. One thing I am curious about is how many hours you worked to get this. Writing, rewriting, promoting, talking to editors, formatting files, etc. In other words, what is your hourly rate? It probably averaged about 20 hours/week, though that goes up with the quitting of the full-time day job. Thank you for doing this. It helps to see it plainly. That’s a decent income for 20 hours per week, but I know it didn’t show up overnight or without hard work. I’m grateful you’re will to share. Gives those of us who aren’t making squat yet faith and something to shoot for. Thanks so much for sharing. Huh. I hadn’t thought about it too hard – I think I’ve fallen into the “this is how I’ve done it in previous years” trap, and just kept doing the same. Most of the books have earned out. I think the only exceptions are Unbound, Revisionary (which isn’t out yet), and the Fable tie-in book. In part, that’s because the advances were larger on those. Let me think about advances and what I’d be able to share, and what I’m comfortable sharing publicly. Thanks! This looks great, Jim, I love the upward trend. Congrats. Also, much respect for providing the data. Jim, do you have any idea what portion of your income came from ebook editions versus printed books? Like pretty much any genre, Fantasy can be awesome for self-publishing. It can also be terrible. Depends on you, your books, and your ability to write, publish, and market. 2) Release often. Like no further apart than every 3 months. Every 30 days is better, honestly, but a tough schedule to keep. 4) Experiment with pricing, have loss-leaders, run ads, and do your best to stay on the pulse of where your target readership is and how to reach them. There’s no one right way to do this, and I figure if you’re making a decent living, that’s pretty darn awesome! Go you! I’m not as prolific as Annie B, but I have had a couple of decent years self-publishing fantasy and epic fantasy. In 2015, I did about as well as Jim did, but I released four books (well, one was Dec ’14, but you know.) This year I’ll have nothing to release, and the pennies, they are being pinched. My plan is to return to the traditional side with my next book, in the hopes that the backlist bump will be significant once a large publisher’s marketing division begins to work. Hybrid, that’s me. In the meantime, for self-publishing, Good cover, good title, good books, preferably in a series. I’m a fantasy self published author and marketing/promoting is going to be the death of me. I have 3 books out but I cannot afford high end marketing/promo schemes. Is there anything you (or anyone here) can recommend for the starving artist type to get the word out and be seen? Thank you so much! I wish someone had a surefire answer for that. I’d suggest getting involved with some of the self-publishing groups and discussion boards online. You should be able to get some suggestions and options that way. As a hybrid author – I highly recommend the practice. The problem, of course, is not everyone has the option. You have to do two very difficult things (a) self-publish well and (b) get a traditional publisher to fork up a contract for your work. Either by itself is monumental – those that can do both are an even smaller subset. Still, those who can go hybrid I think will benefit tremendously, both from diversity and agility. Good luck with it. First off, congratulations for going full-time in 2016 – good on you. Second, as always, thanks for sharing this information – it’s a great thing you do, pulling back the veil. I’ve mentioned in the past that these posts did a great deal to set my own expectations before I started publishing. I keep wanting to do something similar for myself, and hope to one day.